The books have over 100 pages of content printed and bound to hold up in tough environments such as shops and front desks. The books cover Duramax tuning up through the 2010 LMM and up to 2009 Cummins. There are now additional years of Diesels currently supported by EFILive software that are not included in the book at this time and may never be added (although all the tuning basics taught in these books apply to every diesel motor, regardless of what year). With these books, and how they are written to accompany the training courses I offer, it is very important that you start at the front of the book and work your way through. Interested in EFILive Diesel Training? These books are dedicated to teaching terminology and basic tuning information needed to work on Duramax and Cummins vehicles. It is accompanied by a CD with test files, tutorials and other essential information to get you going with your EFILive V2! These books contain terminology and information related specifically to EFILive Software releases through April of 2014. The newest software is contained on the CDs that accompany the book, or can be downloaded for free from EFILive’s website. Shipping is via USPS Mail, and is included in the price! 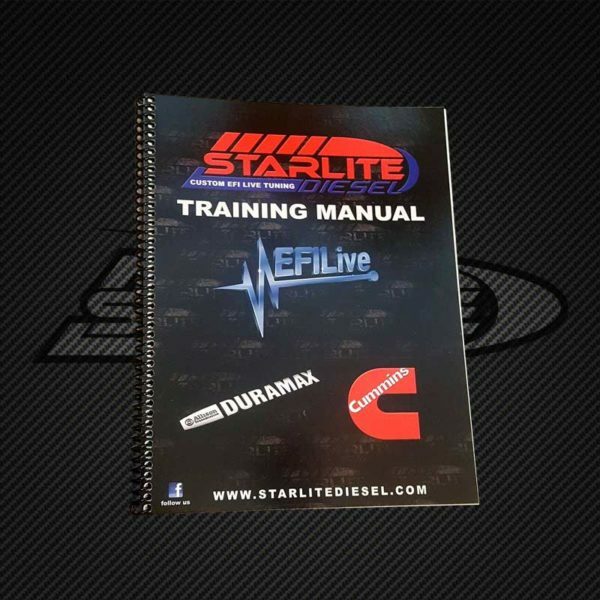 These books are used in the StarLite EFILive Diesel training classes themselves. As such, they are written and geared towards in class participation. However, they are more than just a reference – they walk you through building a basic tune on a Duramax and on a 5.9 Cummins. The specific examples used are a Duramax LLY and a 2007 Cummins 5.9. The books also cross reference the specific examples into LB7, LBZ, LMM and 3rd gen 6.7 trucks. These books give the terminology and information so that the reader can take the knowledge from the book and be familiar enough with the ‘concepts’ to take that knowledge to other year vehicles. IT IS VERY IMPORTANT TO NOTE THIS INFORMATION! 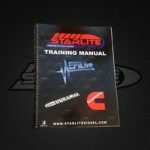 These books will not teach you how to tune highly modified trucks, they simply lay the groundwork for you to be able to understand HOW to tune a truck and work your way through the EFILive tuning software. There are too many combinations of parts and setups to be covered in even a series of books – so laying the foundation is all these book are for. Understanding terminology, tables, how to navigate inside the EFILive software, etc. In addition, there is supplemental information contained on the CDs that come with the books – so many common questions are answered in the additional documentation on the CD. PLEASE E-MAIL WITH QUESTIONS BEFORE PURCHASING IF YOU ARE UNCERTAIN! !